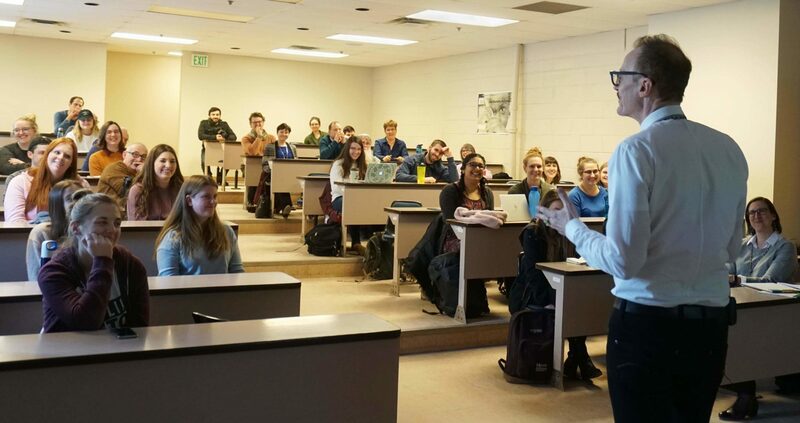 On March 8, President Jean-Paul Boudreau gave a seminar on the insights he and his fellow researchers have gained from observing infants’ object exploration in the field of developmental psychology. The talk was a part of the Honours Psychology Research Seminars. To begin the seminar, Boudreau quoted an inspiration of his, child psychologist Wilhelm Preyer. Preyer wrote that “Frequently repeated movements furnish the foundation for character.” Boudreau said that this is a beautiful concept to him: “It shows you that movement is interwoven with thought … [and] really the theme of my talk today is around how action and cognition interplay,” he said. Boudreau said that in psychologist Jean Piaget’s model of developmental psychology, the first stage in his cognitive theory has sensory motor in it. “If you look at the model and you look at the theory you have this impression that we just need to get past the motor bit, get past sensory motor to get to the good stuff – i.e cognition, thought and representative ideas. And in a sense, motor becomes a little bit less important as you move through that theory,” said Boudreau, noting that he takes issue with this idea. Boudreau said that his goal was to argue against the idea that sensory-motor is less important or interesting than cognition by discussing an array of studies that he has been a part of that look at sensory-motor in infants. One particular study is called the Sticky Mittens Study, which has been repeated by numerous psychologists. The study looks at how training can “change or evolve what is already in place developmentally,” said Boudreau. The study involved research students going to the parents’ houses and training them on how to use the sticky mittens with their three- to 3½- month-old. The mittens are “sticky” in that when an infant touches an object with them, the object automatically sticks to their hand. “If you can train the infant how to do it, the idea is that you start seeing a more progressive, complex motor activity of the hand,” said Boudreau. The data showed a bit of a jump in active engagement. There was “more visual engagement if the parent [was] guiding the activity with the infant,” said Boudreau. At the end of the seminar Boudreau answered questions from both students and faculty. Boudreau answered that the reason for those age samplings was that they wanted to replicate the previous studies that had been done using those ages. “What you don’t realize is that for us a week or a month is nothing, but a month in the life of an infant is worth a decade. So we’re sensitive to that,” said Boudreau. Another student asked if they found it difficult to recruit subjects in that age group. “Where did we get these amazing, beautiful participants who give their time, their energy, and their passion to science? We tried everything from newspaper ads to Kijiji…but a few years ago I fell into, kind of by accident, a gold mine of infants,” said Boudreau.